To help celebrate(?) 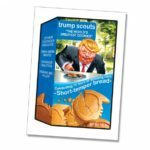 the inauguration of Donald Trump, Topps released a special one time parody set. 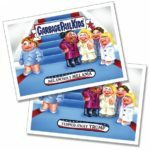 Moving past the Disg-Race series, Topps decided to do a separate set with both GPK a/b cards, and Wacky Packages cards. 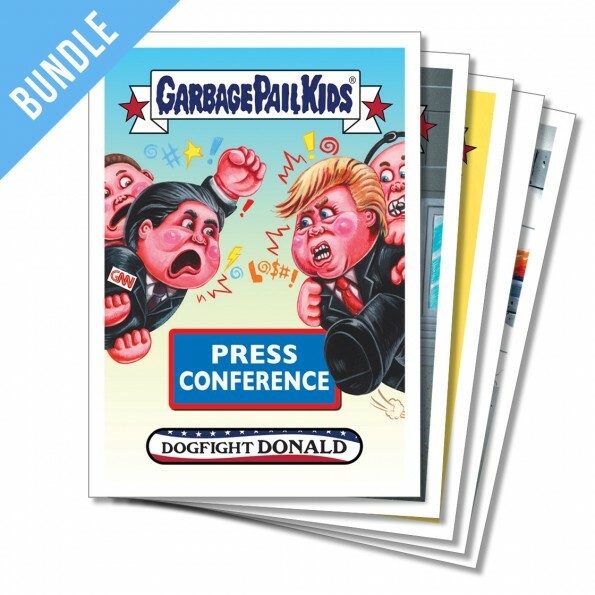 Today Topps revealed the print run for Garbage Pail Kids American as Apple Pie Presidential Inaug-Hurl Ceremony. All cards in the set drew similar sales numbers from the mid to upper 200’s. Here are the final print run numbers for each card printed. The Disg-Race is over! 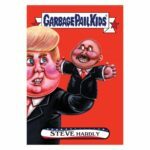 Last Thursday’s offering of Garbage Pail Kids Disg-Race to the White House proved to be the last issue for the set. Topps finally completed the online only set, and moved on to various other online offerings. The set is groundbreaking in a number of ways. 2016 was really the year of the online exclusive for Topps. Topps did a number of things across their properties to see how to offer online exclusives to collectors. Garbage Pail Kids were actually the first property Topps tested online cards with the Iowa Caucus set, back in Feb. of last year. 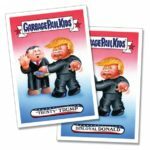 After offering a mixture of political and entertainment based online sets, Topps moved to an individual card offerings for GPK. This matches Topps wildly successful Topps Now Baseball Card brand which launched in April of last year. 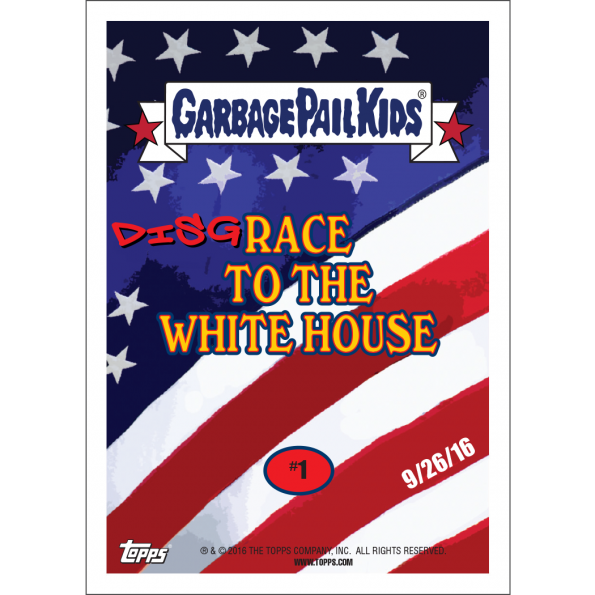 Topps launched GPK Disg-Race on 9/26 with card #1, a parody of the first presidential debate. Originally collectors thought the set would last until the election in Nov. However, as things got crazier and crazier in the election, sales for the cards seemed to increase. Topps decided to ride the wave until last weeks’s inauguration. 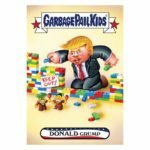 152 – Total number of cards in the GPK Disg-Race set. 135 – Total number of GPK cards in the set. 17 – Total number of Wacky Packages cards in the set. 115 – Total number of days elapsed between the first day the set was offered, (9/26/16), to the last day cards were offered, (1/19/17). 40 – Total number of days during that span cards were offered for sale on Topps.com. 54,480 – Total number of cards printed by Topps for the Disg-Race set. 47,429 – Total number of GPK cards printed in the Disg-Race set. 7,051 – Total number of Wacky Packages cards printed in the Disg-Race set. 1,196 – Highest print run of an individual card, #1 (Disg-Race to the White House). 248 – Lowest print run of an individual card, #143 (Dogfight Donald). There can be more more than 248 complete sets out there. 4 – Cards with a print run over 600, (#1, #64, #70, #102). $1,164.58 – Amount collectors had to spend to complete the Disg-Race set by buying the daily bundles. $1,518.48 – Amount collectors would have spent to collect the set if paying $9.99 per card. This was the most expensive non-eBay option. $606.48 – Amount collectors would have spent to collect the set if paying $3.99 per card. This was the cheapest option, only if the 20 card lot of each individual card was purchased. $544,255.30 – Gross sales total for all cards printed by Topps, if collectors spent $9.99 per card. This would be the highest possible amount made, which we know didn’t happen. Most collectors bought the bundles for their sets. There were also dealers who purchased card lots for re-sale. Its impossible to know how much Topps really made selling the Disg-Race. 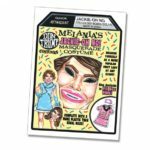 While its not clear if the Disg-Race to the White House set is finished or not, that won’t stop Topps from making the Trump cards. 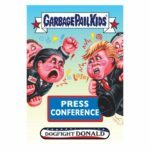 Today Topps launched 2017 Garbage Pail Kids American as Apple Pie In Your Face Presidential Inaug-Hurl Ceremony online set. The set falls under the Apple Pie banner, as opposed to the Disg-Race label. The set is comprised of 8 new GPK paintings, available as a 2 card a/b set, and 3 Wacky Packages cards. All cards are based off the president’s inauguration last week. Each a/b GPK card, or Wacky card can be purchased for $9.99. 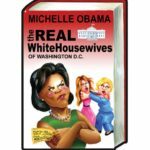 The entire 19 card set can be purchased for $49.99. Free shipping is available via the SmartPost option. The cards will be available on Topps.com for 7 days. Topps will reveal the print run at the end of the sale. Here is the checklist and pictures of the new cards. 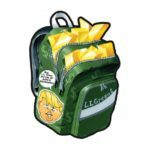 Topps got some good news with the third presidential election release of the week as sales were up for the week. 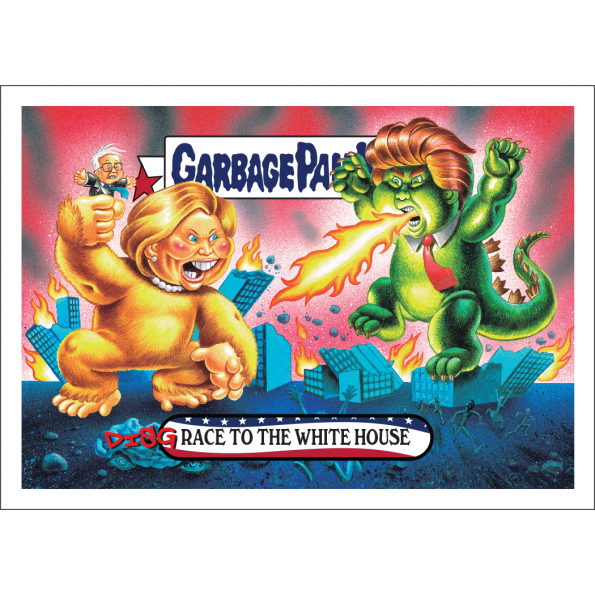 Today Topps revealed the print run for Garbage Pail Kids Disg-Race to the White House cards #150-#152. As usual the Wacky Packages card led the way with sales with 370. Sales of the GPK cards were slightly higher, especially with card #151. 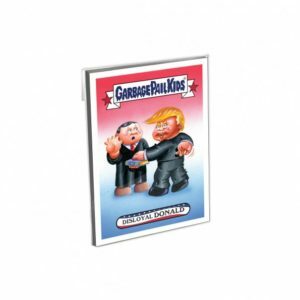 The card, featuring Legos and Trump, finished with 339 in sales. It’s expected today’s presidential inauguration will mark the end of the Disg-Race set. Look for Topps to possibly release one more set based on today’s festivities. Here are the final numbers for the third release this week. In what looks to be the final week of releases for the presidential election sets, Topps is going full steam ahead. 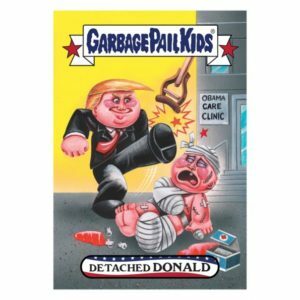 Today Topps revealed the print runs for Garbage Pail Kids Disg-Race to the White House cards #147-#149 and Network Spews #3. The second online release this week faired only slightly better than the previous day’s cards in sales. 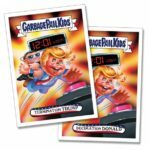 While no record lows were set, the GPK cards stayed in the mid 200’s sales wise, including the Network Spews card. 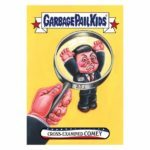 The Wacky Packages card did rebound with 342 in sales. 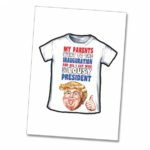 All indications are the Disg-Race set will finally wrap up after the inauguration on 1/20. Here are the final numbers for the second online release of the week. Sticking to their regular online launch schedule, Topps is back at it for the third straight day with the presidential election cards. 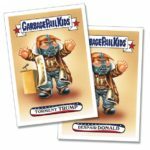 Today Topps launched Garbage Pail Kids Disg-Race to the White House cards #150-#152. 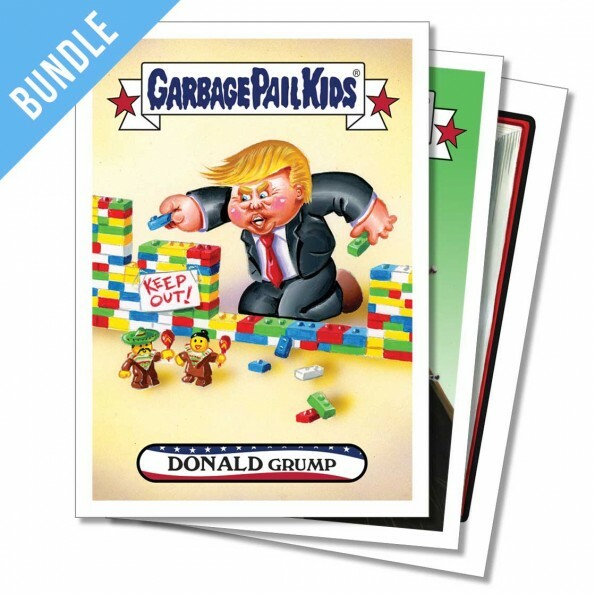 There are only three new cards today, two GPK and one Wacky Packages card. As usual each card can be purchased for $9.99 or in lots of 5 for $29.99, 10 for $49.99, or 20 for $79.99. A three card bundle feature one of each card can be purchased for $24.99. Free shipping is being offered via the SmartPost option. The cards will be available for sale for 24 hours on topps.com. Topps will reveal the print run of the cards at the end of the sale. Here are pictures of today’s offerings. 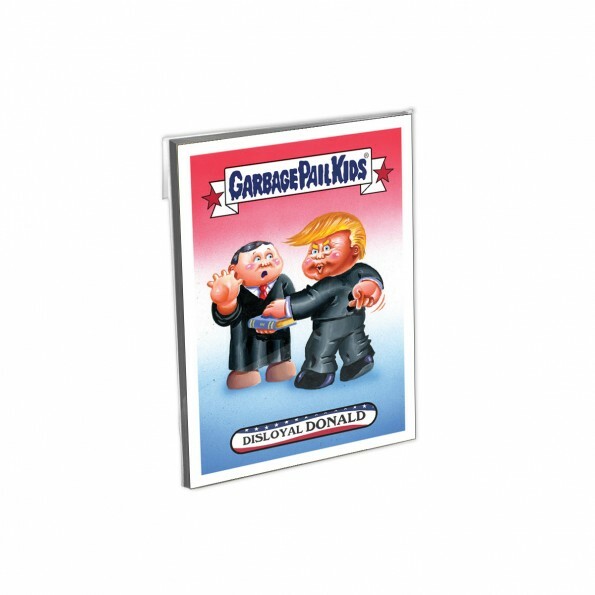 In the midst of a major retail launch this week of the latest GPK set, Topps is continuing their run of presidential election cards. 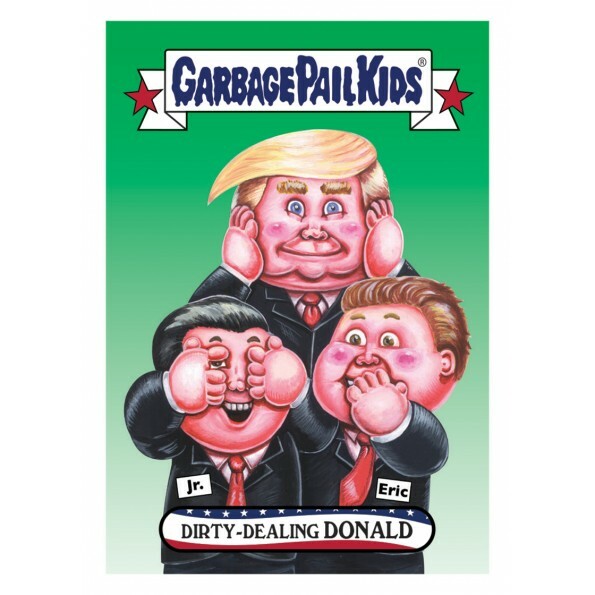 Today Topps revealed the print run for Garbage Pail Kids Disg-Race to the White House cards #143-#146 & Network Spews #2. The first release this week saw record low number of sales. 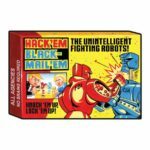 Collectors seem to finally be tiring of the Disg-Race cards. 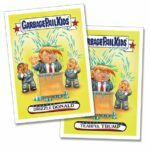 No card, including the Wacky Packages card, reached 300 in sales. In fact card #143 became the lowest selling Disg-Race card to date at 248 copies. The Wacky Packages card was also the lowest selling Wacky online card to date. The Network Spews card ended up doing better than two of the GPK Disg-Race cards. Topps is expected to finally finish with the Disg-Race set this Friday after the inauguration. Here are the final numbers for the first release this week. It’s Wednesday and Topps is sticking to their usual online release schedule with the second batch of presidential election cards this week. Today Topps launched Garbage Pail Kids Disg-Race to the White House cards #147-#149. 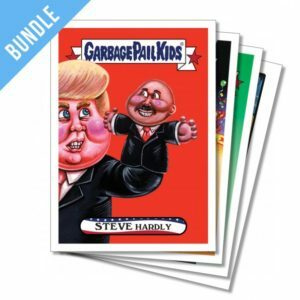 Today’s cards feature two GPK cards and one Wacky Packages card. 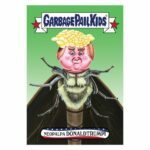 For the second day in a row Topps also launched Garbage Pail Kids Networl Spews card #3. Today’s card is focused on the recent news of closing of the circus. Each card can be purchased for $9.99 or in lots of 5 for $29.99, 10 for $49.99, or 20 for $79.99. A four card bundle featuring one card of today’s new offerings can be purchased for $29.99. Free shipping is being offered via the SmartPost method. The cards will be available for 24 hours on Topps.com. Topps will reveal the print run at the end of the sale. Here are pictures of the new cards. Its Tuesday, and that means Topps is right back on schedule with the presidential cards. 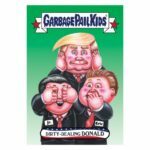 Today Topps released Garbage Pail Kids Disg-Race to the White House cards #143-146. Today’s release focusing on Trump and his cabinet nominations, contains three GPK cards and one Wacky Packages card. 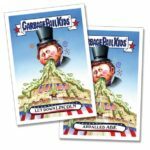 Topps also today launched Garbage Pail Kids Network Spews #2. As per usual each card can be purchased for $9.99 or in lots of 5 for $29.99, 10 for $49.99, or 20 for $79.99. A five card bundle featuring each card launched today can be purchased for $34.99. Free shipping is being offered via the SmartPost option. The cards are available for sale on topps.com for 24 hours. Topps will reveal the print run at the end of the sale. Here are pictures of the new cards. 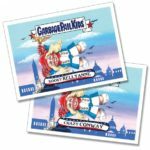 The third presidential election release this week brought a little rebound in sales for the GPK cards. Today Topps announced the print run for Garbage Pail Kids Disg-Race to the White House cards #138-#142. 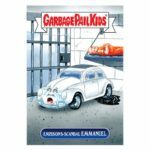 Once again the Wacky Packages card led the way in sales with over 400 copies sold. Unlike yesterday however, the sales for the GPK cards bounced back to closer to 300 in sales. All indications point to the Disg-Race set ending next week. Expect a full compliment of cards next week along with a big finish on inauguration day, 1/20. Here is the final print run information.